Last time I flew with Qatar Airways it was about 8 years ago and in economy. My key memory was how dreadful Doha airport was – it was a giant tacky duty-free shop plus endless smoking rooms. Well, things have changed!!! 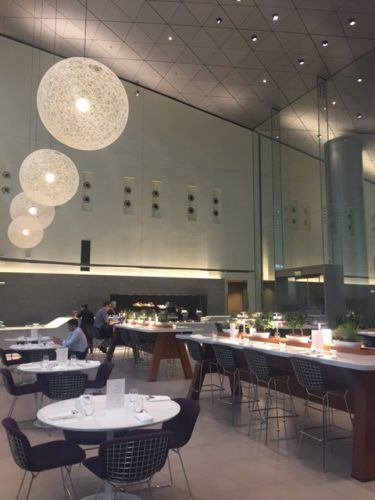 I was beyond delighted with my Qatar Airways Business Class experience and Doha airport is now giving Changi a run for its money! 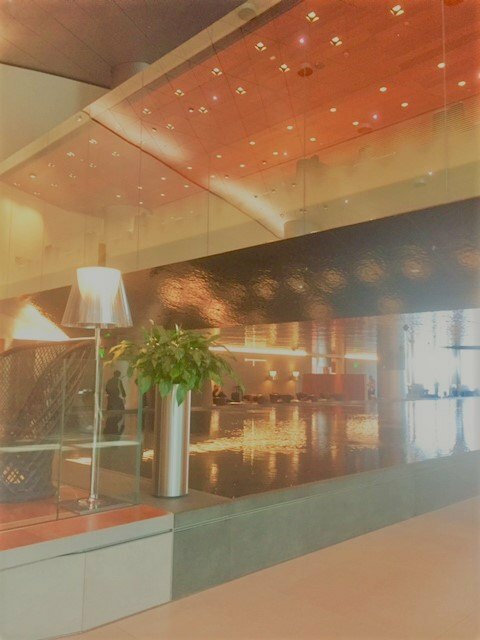 Here is my complete Qatar Airways Business Class Review on the a380 including Doha Airport Lounge. How tasty do these look? So let’s start where so many of my journeys do – Heathrow. Terminal 4 in this case. The Qatar Heathrow lounge is located near Gate 6. 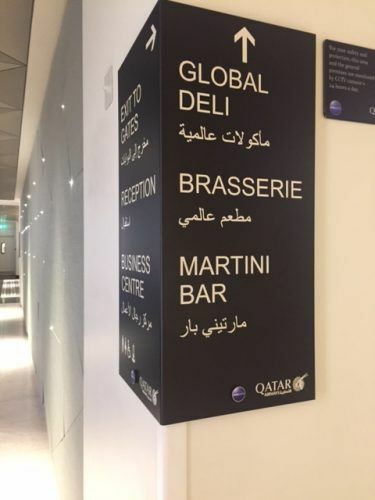 Make sure you use the Qatar lounge Heathrow and not one of the shared ones. The lounge is beautifully laid out with extremely comfortable seats. There is a proper restaurant with a proper menu and proper ordering! Most importantly there was also proper champagne – Laurent. This is the kind of lounge that makes you want to get to the airport early. The plane itself was lovely – very new and stylish. The seating, however, is not as private as Singapore or Etihad Airlines. The bedding had a fabulous plump pillow but the blanket was quite thin – not the nice mock duvet you often get in business in other airlines. The Qatar Airways business class toiletries were good – a slightly old fashioned case but a very nice face spray from Castello Monte Vibiano Vechhio – an Italian brand of which I had never heard. The service was absolutely fantastic and so friendly – as good as my favourite airline for service Qantas. An unexpected bonus was pyjamas! Again I have only ever had this in virgin business before. And very comfortable pyjamas they were! The in-flight entertainment system is fantastic! A great big screen and the most up to date movie options that I have ever seen. I didn’t eat as it was a late flight and I had eaten in the lounge but a full menu was available on demand. Click here to read my Review of Thai Airways Business Class. What an airport!!! It looks like a giant Apple shop. This could be because there appear to be Apple screens everywhere – this is a country that is cashed up! There are some slightly nihilistic kid’s playground areas but they are good for photos. And let’s not forget the giant teddy bear – who wouldn’t have one?? What a lounge!!!! Wow wow! The Qatar Airways Business Class is HUGE! My favourite feature was the giant pond in it. You could swim laps in the pond it was so big. There are multiple restaurants. The seating is incredibly modern and comfortable and very well thought through. There are clear dining areas, some really nice areas if there are 3 or 4 of you together to have some privacy and lots of very comfortable sort of workstations plus. The food selection is fantastic. 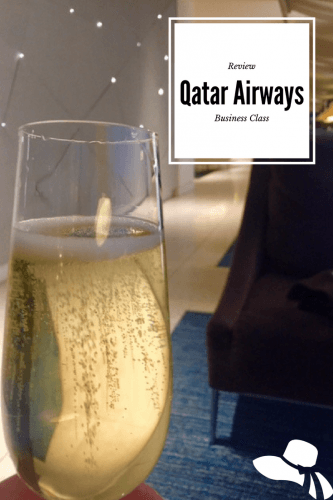 We kicked this off with something I very much enjoyed – Qatar Airways Business class had its own bus to go from the terminal to the plane! And what a plush and spacious bus it was! No standing and being jostled for us – these middle eastern airlines sure know how to make you feel special. 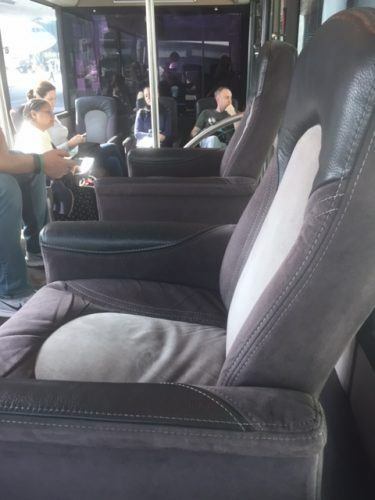 Plush seats for an airport bus! As expected this flight involved an older plane. It was classic old school business class – no beds of course but a comfortable seat. 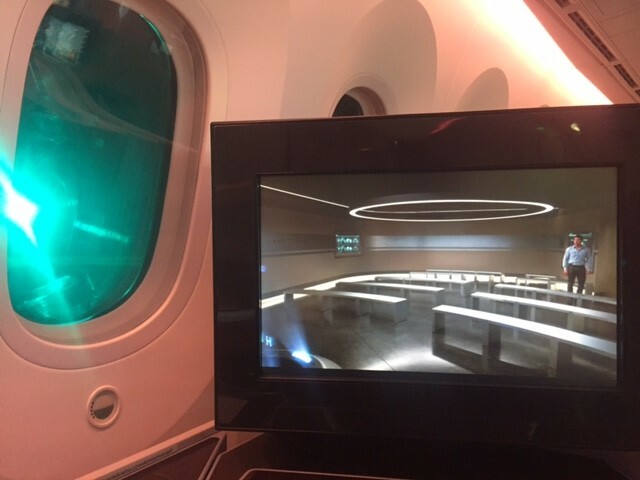 The entertainment system available was virtually the same as the first leg but the screen was smaller and less modern. The lounge in Kathmandu is not Doha standard but amazing for Kathmandu! My expectations were very low for this lounge. 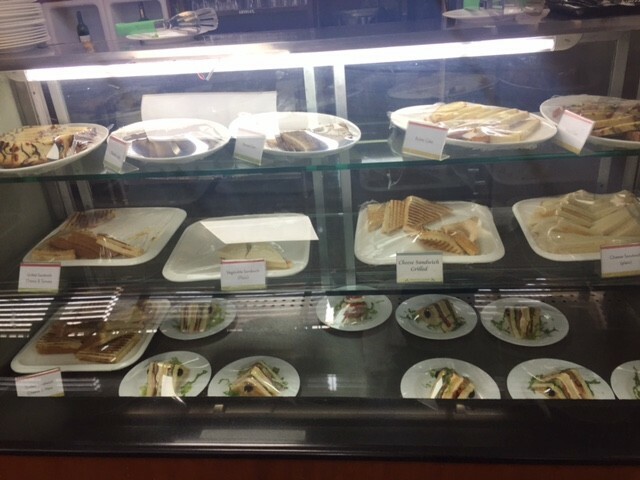 The worst business class lounge I have ever been to was at Manila airport and this is where I had my expectations. I was delighted to be proven wrong! 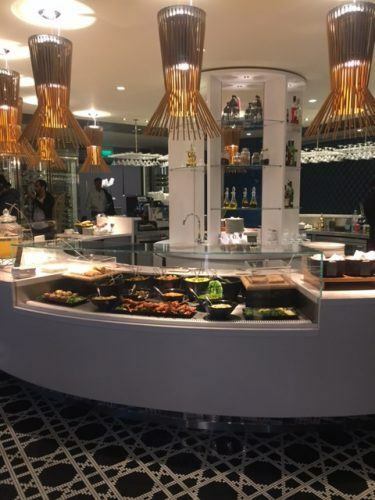 It is a shared sort of generic lounge but it is part of the Radisson Hotel at the airport. There was a lot of food available. To be honest it didn’t look that tasty but it was only about 11 am when I was there so maybe it improved. The wifi was excellent importantly. Not super appealing but at least a good amount! The Kathmandu to Doha leg was pretty much the same in reverse – except I had some nice champagne on the flight (so appreciated after 3 weeks in Nepal!!) and some delicious lamb shanks. 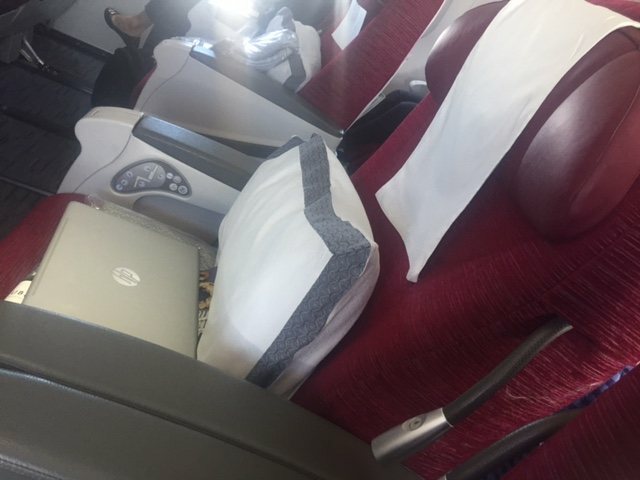 The only difference on the Doha to London leg was how the entertainment system operated. It was a fantastic screen and the same great entertainment system on the way out. 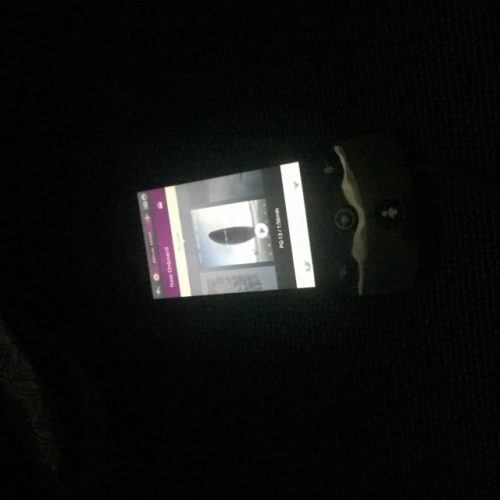 However, the screen wasn’t touch and you needed to use this kind of iPod device that was quite difficult to use. It also meant you couldn’t check out movies on the big screen which is how I like to make my inflight film decisions. Apart from that everything was terrific. 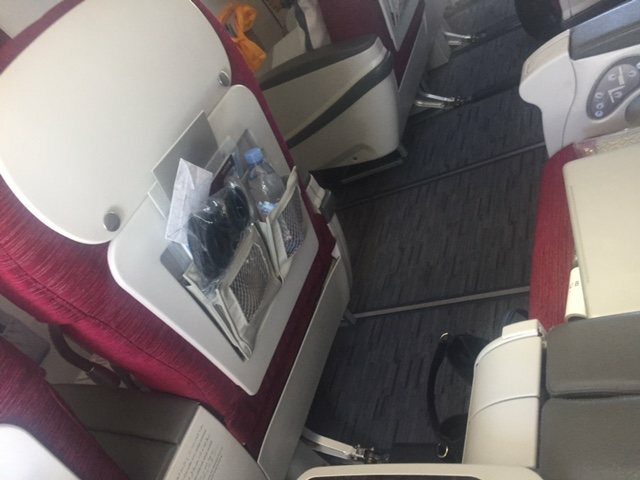 This Qatar Airways Business Class Review is definitely a high thread count airline equivalent and I will be flying with them again. 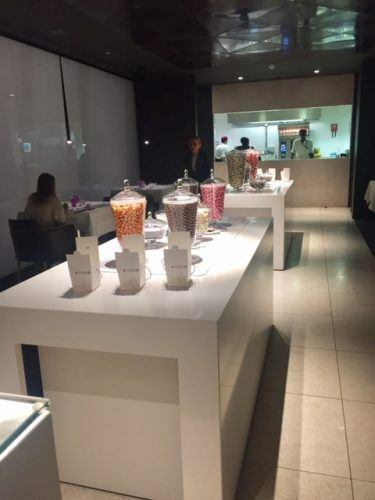 Doha is full of high-end upmarket hotels like the W Hotel and the Four Seasons. 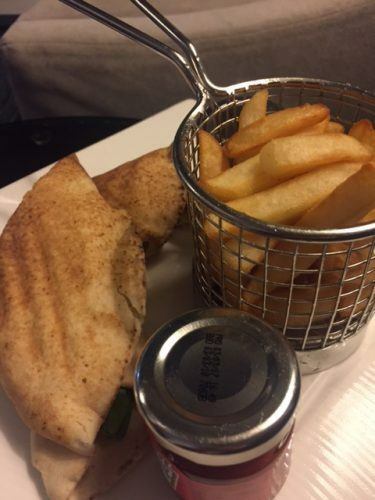 If you are after a more boutique option have a look at Souq Waqif Boutique Hotel, Al Zubarah Hotel or the slightly cheaper but still boutique Hotel K108. Heading to Kathmandu? Click here to see my long weekend in Kathmandu post, Read my review of Dwarika’s Kathmandu and my review of Dwarika’s Dhulikhel. And here is my full Nepal Itinerary – what I did and what I would do differently. Scan my full Everest Base Camp packing list, a day by day guide to the trek and what to expect at the tea houses. And don’t head to Nepal and go trekking without some Travel Insurance.I ended up needing mine!. Have been flying Qatar for quite some years now as my Parents stay there –really a Brilliant Five star experience. Wow! This looks like the lap of luxury. I’ve never traveled in Business class but my husband has. He is a big fan of the Emirates. In my opinion they pamper him a wee bit too much! Lol! Luxury comes at a premium! Doesn’t it? Qatar Airways’ business class tells me that! Nice post with great pics and apt descriptions! WOW ! I fly Qatar often but just economy. Looks like you had a whole different and amazing experience with them! 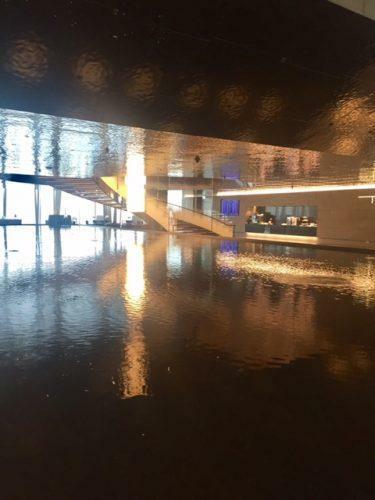 Wow I love the business lounge at Heathrow, looks like a Palace!! 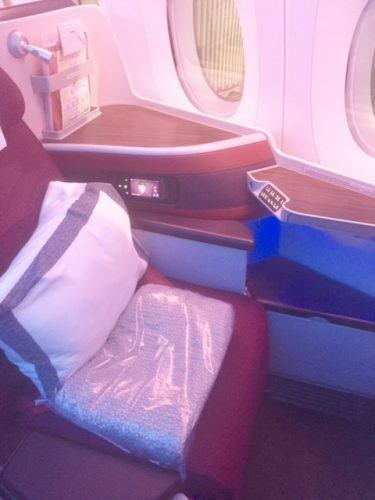 As for the trip itself it seems it was very comfortable, especially the first one, I love the private space in the London – Doha flight. It makes me want to fly with Qatar Airways! Wow! 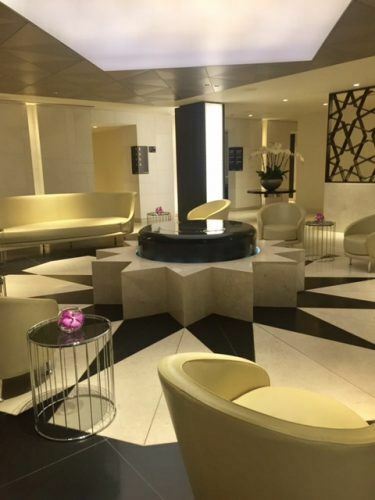 The Business Lounge in both Heathrow & Doha looks so luxurious! It doesn’t even look like a lounge but like a proper high-end restaurant! Cool!!! The in-flight seat looks nice, but those plush bus seats are just stunning!!! Wow!! What an experience. It sure is a luxury. I have never traveled by business class but looking forward to it someday for sure. I had never heard about pyjamas too. It for sure is a bonus. The fish and chips looks really good and so is champagne. Enjoyed going through your post as well as pictures. This is such a great experience! I always travel on a budget. I would love the experience a business class if budget is not a problem. I would love to try a luxury travel experience! So THIS is how the other half live! Interesting review. Not sure I could justify the extra spend but I must admit I enjoyed being upgraded to business class for free on an Etihad flight. Could happily fly in luxury every time! Pretty neat! Flying business (and first!) is truly an experience. I love that you’re able to relax, have snacks and drinks, and even complimentary massages or facials while waiting. So convenient. The leg room is heaven. Oh my word that looks fabulous, I was sold at Martini bar! 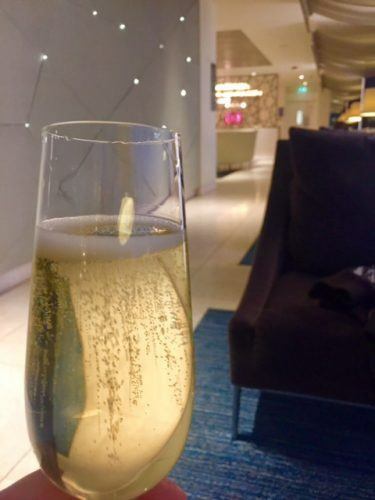 Thanks for sharing – it may be the only way I ever experience such luxury travel! I haven’t tried flying with Qatar Airways and this one is truly amazing. I like how they treat the passengers and the service is truly great. How I wish to experience this as well. By the way, you own an amazing review. I liked the Heathrow and Doha lounges! They look so luxurious! Great review and you’ve covered all the points in quite details! Though I have never traveled with Qatar Airways! I’ve never actually flown Qatar airways before, but have heard nothing but good things! I’ve also never flown business class on an international flight, but it looks delightful! Have never flown by Qatar earlier, but this post definitely gives me food for thought. 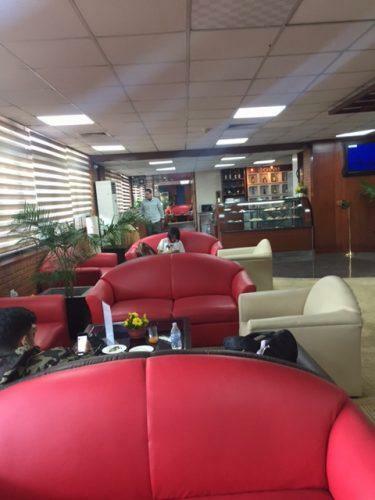 The lounges and the airport facilities look posh and comfortable. And that pool! We recently visited Dubai via Emirates Airline; it was definitely a wonderful experience. Qatar Airways looks pretty cool too; I think at the end of the day, it all depends on what I want to do inside the airline, if I’m going to sleep or just watch movies, then my options will be limited. What do you say? Hi – I tend to spend more for sleeping. It is a shame to miss the inflight experience but at the end of the day sleeping is most important in my opinion!